Reigning champion Marwan ElShorbagy survived a huge scare from Mohamed Abouelghar on day four of the El Gouna International Squash Open as he got his title defence underway on the spectacular glass court at Abu Tig Marina, which hosts the PSA World Tour Platinum tournament. The Egyptian won this title last year, beating current World No.1 Ali Farag in the final, but it looked like he was on his way out after just a single match this time around. Abouelghar had never beaten his compatriot on the PSA World Tour before in three previous attempts, but he started the stronger of the two, and took the first game. ElShorbagy came back to win the second and third with ease, but World No.8 Abouelghar fought back. He eventually had two match balls in the fifth game, but Bristol-based ElShorbagy saved both of them before winning the match thanks to some fine attacking shots at the very end. The win sends the defending champion through to the third round of the tournament, where he will face Switzerland’s Nicolas Mueller on Monday April 22. “It was tough. It is always tough with Abouelghar. We have played so many times,” ElShorbagy said. “I haven’t beaten a top 10 player in a long time and Abouelghar has been playing some amazing squash. I did not know what to expect because this is the best he has ever played. He is on the way up and he now is in the top eight. He is one of the most talented squash players. Also on the glass court, Marwan’s older brother, World No.2 Mohamed, overcame a tough challenge from Hong Kong’s Max Lee, but the former World Champion advanced after a four-game victory to get his attempts to win a second El Gouna International title under way. Elsewhere in today’s action, Colombia’s Miguel Rodriguez had to come from two games down to overhaul Germany’s Raphael Kandra at the El Gouna Squash Complex. Rodriguez had beaten Kandra in two of their three previous meetings – including in the semi-finals of last year’s Allam British Open – but Kandra got the win the last time they played in September’s China Open. The German played some high-calibre squash to go two games up at the Squash Complex, saving a game ball in the second. World No.7 Rodriguez was able to impose himself more on the match though after that point as he ramped up the pace and picked up all of Kandra’s shots at the front of the court as the German lost his basic length hitting. After levelling, the ‘Colombian Cannonball’ made the most of a great start in the fifth to go two match balls up. Kandra fought back to level but, to the disappointment of the German contingent in the crowd, Rodriguez found his winning shots to complete an 8-11, 10-12, 11-5, 11-4, 12-10 victory. “I didn’t start very well, he did though. He really played his best squash there, so from that point on, I changed my strategy,” Rodriguez said after the match. “Instead of going with a slow pace, I increased it and made the rallies longer. He seemed to give up mid-game. I realised he was probably going to be back fighting in the fifth, which he was, and I was ready for it. Mueller also survived a five-game battle on day four, as he overcame Scotland’s Alan Clyne in a match that lasted over an hour. Egypt’s Karim Abdel Gawad, Fares Dessouky and Omar Mosaad are also through to the last 16, along with Mexico’s Cesar Salazar. In the women’s draw, Egypt’s World No.2 Nour el Sherbini is into the third round after beating compatriot Yathreb Adel in straight games on the glass court. The pair had only met twice before on the PSA World Tour, despite having both turned professional in the early part of 2009. The first game was a scrappy one, with neither player able to find any momentum, but El Sherbini was able to pull through in the end to take an early lead. But El Sherbini, who won her second World Championship title back in 2017 on this very court, followed that up with a win in the second game, but that came much tougher, as Adel held a lead for much of the game. However, El Sherbini was too strong for her compatriot and will now take on Egypt’s Nadine Shahin in the next round. “Playing Yathreb in the second round is a very tricky match. We have been playing for a long, long time. I can’t describe how long we have been playing against each other,” Sherbini said after her win. “It was a tough first round, but I am happy with the way I played and I am happy with my performance. I am trying to get back in the mood after the DPD Open. It was a very short couple of days between them but it was a good start and hopefully it will keep going for the rest of the week. France’s Camille Serme won the first match of the evening on the glass court, as she defeated United States No.2 Olivia Blatchford Clyne in straight games. At the Squash Complex, World No.30 Shahin shocked World No.10 Alison Waters to earn her place against El Sherbini on the glass court. It was a momentous day for the Egyptian, as she claimed her first victory over top 10 opposition, and her first berth in the third round of a PSA World Tour Platinum event. “It’s one of my biggest wins so far, I’ve never beaten a top 10 player. I was feeling really excited, and I played her once in Chicago two months ago,” Waters said. “I lost 3-0 really quickly, so I was determined to do better in this one. I had to not lose focus, not even for a second. To beat someone like Alison, you have to be determined, and you have to be 100 per cent focused. 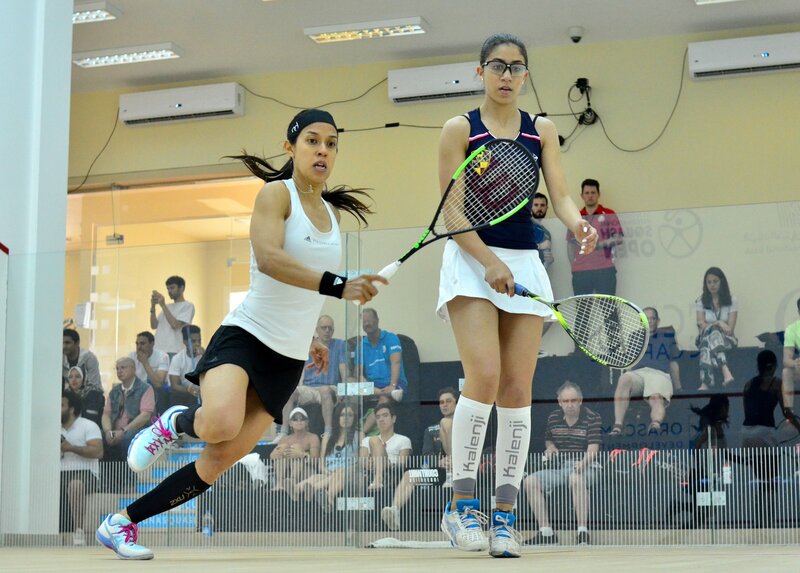 Two other Egyptians are into the last 16 of the women’s draw, as Zeina Mickawy and Nouran Gohar defeated Hania El Hammamy and England’s Millie Tomlinson, respectively. England’s Sarah-Jane Perry, Wales’ Tesni Evans and Hong Kong’s Annie Au are also through to the third round after claiming respective wins over Egypt’s Rowan Elaraby, Canada’s Hollie Naughton and England’s Julianne Courtice. The action continues tomorrow as the top half of the draw play their third round matches across the two venues. Action begins at the El Gouna Squash Complex at 12:00 local time (GMT+2), with glass court action beginning at 18:30 local (GMT+2). Matches from the glass court will be broadcast live on SQUASHTV (rest of world), Eurosport Player (Europe only) and the official Facebook page of the PSA World Tour (excluding Europe and Japan). For more information, visit the tournament website or follow the event on Twitter and Facebook. Egyptian World No.1s Raneem El Welily and Ali Farag have both made it through to the third round of the El Gouna International Squash Open after winning on the spectacular glass court at Abu Tig Marina. El Welily got the better of eight-time World Champion Nicol David in the first match on the glass court this evening, winning the match in straight games, 11-4, 11-9, 11-8. The World No.1 had met the former World No.1 27 times on the PSA World Tour, with their first meeting all the way back in 2001. David had won two-thirds of the precious clashes – including a stunning comeback from four championship balls down in the 2014 World Championship final in Cairo – but Welily had prevailed in the last six. She did so again in this one to advance to the last 16 of the tournament. “I am really happy to have been on court with Nicol again. I was looking at the head-to-head right before the match and we have played so many times,” Welily said after the match. “To play with her one last time, especially in Egypt, is an absolutely fantastic feeling for me. This past month, I have been spending a lot of time with her. We had an exhibition tournament in Birmingham and that was a special week for me. Also on the glass court this evening, World No.3 Nour El Tayeb got the better of 42-year-old Rachael Grinham in straight games. The Egyptian only needed 18 minutes to seal victory, securing her passage through to the third round. At the side courts – staged at the El Gouna Squash Complex – the big shock came through Belgium’s Tinne Gilis’ victory over India’s World No.16 Joshna Chinappa. 21-year-old Gilis will now appear in the third round of a PSA Platinum tournament for the first time after she held off a comeback from the Indian player to prevail 11-8, 11-5, 6-11, 10-12, 11-4. Their only previous meeting came in January’s J.P. Morgan Tournament of Champions – with Chinappa winning in straight games – but it was all Gilis in the opening stages as she hit her marks early on to take a two-game advantage. The third game went the way of Chinappa as the 32-year-old controlled proceedings, while she narrowly took the fourth on a tie-break to restore parity. Gilis regrouped impressively though and a composed performance from the Belgian saw her keep Chinappa at bay to cruise home in the decider, earning her a spot on the glass court at the Abu Tig Marina, where she will play El Welily. “This is the first time ever I beat a top 20 player, and it’s probably the best I’ve ever played too,” said Gilis. “It was the same game plan as my previous match, slowing the pace down as she is a hard hitter, and then attacking only when the opportunity arose. Elsewhere in the women’s draw, Mariam Metwally came through a feisty encounter with England’s Victoria Lust in the only other surprise victory, while former World No.1 Laura Massaro required five games to see off Gilis’ older sister, Nele. World No.1 Ali Farag is through to the third round of the El Gouna International after he overcame a stern test from Cameron Pilley. The Egyptian, who is the reigning World Champion, got off to a good start in the first, but the Yamba-native bounced back and had game balls to win the opener. However, Farag was able to save both, and turned the game on its head to win it 14-12. He then took the second 11-7 to take a commanding lead in the match. The Australian continued to play well, though, and eventually got a game on the board, his first in four matches against the World Champion. Farag would win the fourth game to take the match, though, and move through to the third round of the tournament. “I actually think I started off well, and then the conditions were really tough, so I think the experience played a role here and he knew how to play them better,” Farag said of Pilley. “I think I was slightly off the mark because the turnaround between here and Holland was really short. The last person you want to play against when you are slightly flat is Cameron because he can cut you off in the middle of the court, and he did that really well in the first three [games]. The other men’s second round match on the glass court saw Tarek Momen beat compatriot Zahed Salem in four games. The World Championship finalist beat Salem in three quarters of an hour to move into the last 16. The big shock of the day in the men’s draw came at the Squash Complex this afternoon, as England’s Adrian Waller overcame World No.18 Gregoire Marche. The pair were meeting for the first time since 2016 – with Marche winning on that occasion – but the Frenchman was unable to really get into the Englishman this time round as Waller won 13-11, 11-6, 11-3 to advance to the next round. Waller will now appear in the last 16 of this tournament for the first time and will play the winner of Germany’s Simon Rösner or England’s Tom Richards, who will contest the final men’s side court fixture of the day. “Me and Gregoire have played ever since we were young. We’re similar ages, and I think it does help that I’m so familiar with his game throughout the years,” Waller said. “Even though we haven’t played a in a long time, I still watch him. I stuck to my old tactics today, was nice and steady, and frustrated him as much as I could. The rest of the men’s action saw No.5 seed Simon Rösner and No.7 seed Paul Coll win their matches in three, with Joel Makin, Diego Elias and Saurav Ghosal also moving into the last 16. Second round action continues tomorrow, with the bottom half of the draw in action. Play begins at El Gouna Squash Complex at 12:00 local (GMT+2), with glass court action getting underway at 18:30 local, as Marwan ElShorbagy begins his defence of the title he won last year. Spain’s Iker Pajares Bernabeu and England’s Julianne Courtice secured surprise victories against France’s Lucas Serme and Hong Kong’s Joey Chan, respectively, on day two of the El Gouna International as the PSA World Tour Platinum event continued at the El Gouna Squash Complex. World No.59 Pajares overcame the higher-ranked Serme to ensure that a trio of Spaniards will line up in the second round of the El Gouna International for the first time. 23-year-old Pajares is ranked 26 places below Serme in the PSA World Rankings but put in a fine performance to win 11-8, 11-5, 11-7 and beat his opponent for the first time in his career. Serme had won all four of their previous matches on the PSA Tour – including a 3-1 win in the final round of qualifying 12 months ago in El Gouna – but Pajares avenged those defeats with an accurate performance to join compatriots Borja Golan and Edmon Lopez in the last 32. Bernabeu will line up against former World No.3 Omar Mosaad in the next round as he bids to reach the third round of a PSA Platinum tournament for the first time. “I’ve played Lucas four times on the PSA, and I’ve lost all of them,” Pajares said afterwards. “I’m happy to beat him in three today, I felt very confident today on court, yesterday Borja and Edmon won, so that gave me confidence for today as well. Egypt’s Fares Dessouky is also through to the second round after beating Todd Harrity, having been granted a wildcard spot in the tournament as he continues to make his way back from injury. A torn ACL had seen him plummet down the World Rankings, falling as low as World No.502 in January. The 24-year-old has risen back into the world’s top 50 since then and now sits at No.42. The two-time El Gouna semi finalist came through his first round match against Harrity with relative ease winning out in 36 minutes to claim a third successive win over the men’s United States No.1. “I'm very happy with the way I played, it was a very tough match, and the score doesn't say everything. It was tough physically as well, the court was a bit bouncy, and I had to adapt my game,” Dessouky said. Elsewhere in the men’s draw, Alan Clyne shocked Hong Kong’s Tsz Fung Yip to advance in the other surprise result of the day, while compatriot Greg Lobban is also through to the last 32. Nicolas Mueller, Youssef Soliman, Nafiizwan Adnan, Cesar Salazar and Max Lee also navigated their way through their first round matches today. There was also a surprise in the women’s draw, as Julianne Courtice beat Hong Kong’s Joey Chan in a five-game thriller to book her place in the second round. The pair had never met before on the PSA Tour, and the Englishwoman, who sits 23 places below World No.17 Chan, claimed an 11-7, 9-11, 17-15, 11-13, 11-8 victory. Courtice’s reward for beating Hong Kong's No.2 is a clash with Hong Kong’s No.1 Annie Au, with the pair set to face off on the plaster courts at the Squash Complex on Saturday April 20. “It feels great. I have been wanting a win against one of the top 20, top 30 players for a while now,” Courtice said after the win. “I just felt relaxed going into this one, and obviously it was really tight in the games, but I feel great in getting through. [I was] definitely panicking. I probably took the third when she was ahead, and she took the fourth after being ahead and me coming back. It was just nip and tuck all the way. When we went into that fifth game I just told myself to go for it. Also in the women’s draw, Yathreb Adel secured her passage through to the last 32 after she defeated South Africa’s Alexandra Fuller in straight games. Adel, who sits at World No.18, showed her class throughout against the South African, ranked 27 places below her in the world. Although Fuller bounced back from an 8-2 deficit in the third game to send it to a tie-break, Adel was able to take the victory and set up a meeting with three-time World Champion Nour El Sherbini in the second round. “I am very happy to be through today in three. Alex is obviously one of the good players on court, and it is tricky to play her so I am happy to come out with a 3-0 win today,” Adel said after her victory. There were also victories for fellow Egyptians Nadine Shahin, Rowan Elaraby and Zeina Mickawy at El Gouna’s Squash Complex. Millie Tomlinson, Olivia Blatchford Clyne and Hollie Naughton also secured wins, against Ho Tze-Lok, Liu Tsz-Ling and Rachel Arnold, respectively. The top half of the draw will play their second round matches tomorrow starting at 12:00 local time (GMT+2), with the seeded players entering the draw at this stage. The majority of matches will take place at the El Gouna Squash Complex, while the likes of World No.1s Ali Farag and Raneem El Welily will be in action at the glass court at the Abu Tig Marina from 18:30 local (GMT+2) onwards. 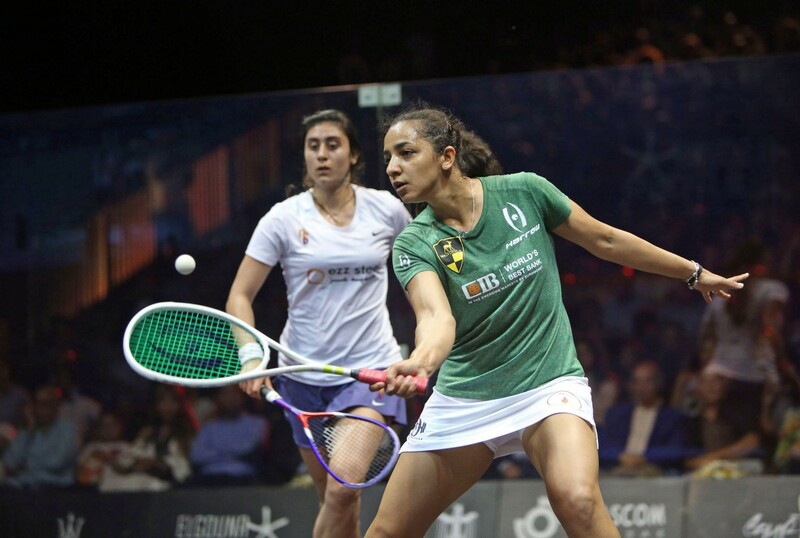 Eight-time World Champion Nicol David survived a scare against Egyptian wildcard Jana Shiha on day one of the El Gouna International, PSA World Tour Platinum event as she prevailed in a gripping five-game battle at the El Gouna Squash Complex. The top half of the first round action took place today, and Malaysia’s David, a former World No.1, booked her place in the last 32 thanks to an 11-7, 6-11, 13-11, 6-11, 11-8 victory. Youth met experience as 17-year-old Shiha performed admirably in front of her home crowd, and she twice came back from behind to level the match before pulling ahead to 8-6 in the fifth to put herself on the brink of a massive upset. But David, 35, dug in and used her experience to come back to take the win, setting up a round two clash with World No.1 Raneem El Welily on the glass court at the El Gouna Marina. “I did what I could, I knew these youngsters are trying to take any opportunities that come their way,” said David. “I was playing pretty well, but then she found the windows to take the opportunities and she played really well. I lost a bit of my focus on the ball and my timing, and at the end I knew I had to really dig deep. My focus came in at the right time, and I’m very pleased to win that 3-2. Also surviving in five games was World No.21 Emily Whitlock, as she came from two games behind to overcome another Egyptian, Nada Abbas. Abbas has been struggling with a foot injury since January, but she has still been able to reach two PSA Tour finals in that time, and her talent was evident in the opening two games as the 18-year-old controlled proceedings at the El Gouna Squash Complex. A 2-0 deficit seemed to kick Whitlock into gear, and she found a lot of joy with some accurate backhand drops as she dropped just a solitary point in the third. The Englishwoman kicked on from there to secure victory in five games. The 25-year-old will play United States No.1 Amanda Sobhy in the second round. “The last place I wanted to be was on a squash court, I just haven’t been enjoying it, but I treated it like I was on holiday, a going to the gym in the morning, chilling out in the afternoons kind of thing,” said Whitlock, who celebrated her 150th win on the PSA Tour. There were also victories for the Gilis sisters, World No.29 Nele and World No.42 Tinne, who both won to book their places in the second round of the tournament. 42-year-old Rachael Grinham and Egyptian Mariam Metwally claimed respective victories over Scotland’s Lisa Aitken and New Zealand’s Amanda Landers-Murphy, while there were wins for Danielle Letourneau of Canada and Coline Aumard of France. In the men’s draw, up-and-coming Egyptian Mostafa Asal saw off Campbell Grayson to secure his spot in the second round of the tournament, winning 11-6, 12-10, 11-4. 17-year-old Asal, the World No.41, won the first 11-6, but there was a lengthy delay in the second, as the Kiwi needed treatment to a cut below his left eye. The delay lasted around 20 minutes, and when he came back onto the court, the Kiwi put in some fine rallies to send the game to a tie-break. However, Asal managed to win the second, before going on to win the third to secure the match, booking his place in the second round against Joel Makin. “I am happy today that I managed to work on my footwork and I managed to play his game. It was tough but I am happy that I managed to win the second game because he was a little bit tired, so I am happy that I went through and I am looking forward to my next match,” the Egyptian said. The big shock of the day came through Edmon Lopez, as the World No.62 overcame Hong Kong’s Leo Au, who sits 38 places above the Spaniard in the rankings. Au had won both of their previous matches on the PSA Tour, but Lopez – who only came into the draw on Sunday as a result of Ryan Cuskelly's withdrawal – prevailed in an attritional affair to win the biggest match of his career, winning it by an 11-5, 16-14, 11-13, 11-6 scoreline to set up a second round match with India’s Saurav Ghosal. “What made the difference today was the fact that I was strong physically and made sure I prevented him from playing his lob/drop shot game by picking up the pace as much as I could. It was hard for me because I had to keep the pressure up, but I'm glad it worked,” Lopez said. Fellow Spaniard Borja Golan also took victory in round one, along with English duo Adrian Waller and Tom Richards, Egyptian maverick Mazen Hesham and Australia’s Cameron Pilley. First round action continues tomorrow, as the bottom half of both the men’s and women’s draws kick off their campaigns at the El Gouna Squash Complex. The world’s best squash players will go head-to-head on the banks of Egypt’s Red Sea between April 17-26 after the main draws for the 2019 El Gouna International Squash Open were released today. The El Gouna International is the penultimate PSA World Tour Platinum tournament of the 2018/19 season, and an equal prize fund of $352,000 will be on offer across the men’s and women’s draws. Men’s World No.1 Ali Farag will top a PSA Platinum event for the first time and he will look to improve on last year’s runner-up finish to fellow Egyptian Marwan ElShorbagy. Farag, along with the rest of the top eight seeds in the men’s event, receives a bye into round two, where he will play either Australia’s Cameron Pilley or Egypt’s Tayyab Aslam. Farag is drawn on the same side of the draw as Peru’s Diego Elias, Canary Wharf Classic winner Paul Coll and compatriot Tarek Momen, the latter of whom he beat in the final of the PSA World Championship final earlier this month. No.2 seed Mohamed ElShorbagy, the 2016 El Gouna International champion, features on the opposite side of the draw alongside British Open champion Miguel Rodriguez, defending champion and younger brother Marwan, and former World No.1 Karim Abdel Gawad. Reigning women’s champion Raneem El Welily tops the women’s draw and could face eight-time World Champion Nicol David as early as round two. David, a former World No.1, will retire at the end of the season and will make her last appearance in El Gouna. El Welily beat World Champion Nour El Sherbini to win the inaugural women’s title last year, but the current World No.1 has a difficult path to the final, with the likes of India’s Joshna Chinappa, Hong Kong Open champion Joelle King and World Championship runner-up Nour El Tayeb standing between her and a place in the title decider. El Sherbini, who beat El Welily in El Gouna two years ago to win the second of her three World Championship titles, is seeded alongside World No.9 Alison Waters, World No.8 Nouran Gohar and World No.4 Camille Serme on the bottom half of the draw. Rising Egyptian talents Jana Shiha and Farida Mohamed, both 17, take the women’s wildcard spots and will play David and Zeina Mickawy, respectively. The El Gouna Squash Complex will host the first round matches on April 17-18. Matches will be split between the glass court at Abu Tig Marina and the El Gouna Squash Complex between April 19-22. All matches from the quarter-finals onwards will be held at Abu Tig Marina between April 23-26.